Julie Austin is a dynamic, energetic presenter and performer with over twenty years experience giving concerts for children and families, doing conference keynote presentations and offering teacher and librarian workshops in both music and preschool curriculum. 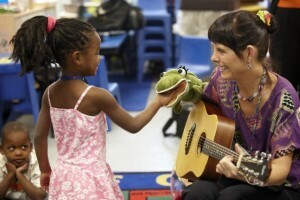 Julie uses storytelling, songs and movement along with guitar, autoharp, ukulele and jawharp to encourage children’s active participation. She has a Bachelor’s degree in Musical Performance, a Master’s Degree in Early Childhood Education and has released six award winning children’s recordings. Her most recent CD, “Fandagumbo,” won a Parents’ Choice Award. Julie is a Wolf Trap Master artist and has been teacher trainer, consultant and preschool teacher with the High/Scope Foundation. Based in Georgia, she travels nationally and internationally. Her enthusiasm, musical expertise and love of creating community through music make her a favorite of audiences everywhere. Invite Julie Austin to Your Community!